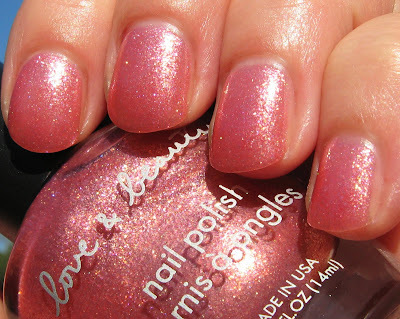 Back in January I ordered some Love & Beauty polishes from Forever 21, and I have 4 of them to show you today. These are made by L.A. Girl and without researching it to be sure, I imagine there are dupes to these in the L.A. Girl line. These are a great bargain at $2.80 each, because they come in a wide range of colors and finishes, and the application is above average. Above: Black/Purple is a black creme with fine purple foil glitter. I used 2 coats on this and I'm quite certain I have several similar shades. Below: Magenta/Black (gotta love those original names!) contains an overload of magenta foil glitter in a black tinted base. 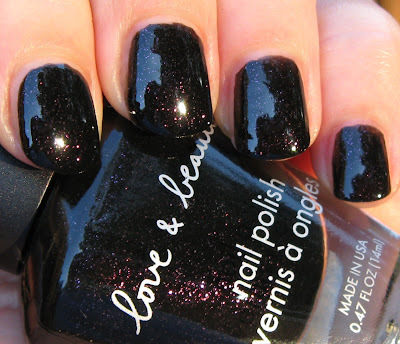 I used one coat over Black/Purple, as it would take 4 coats to get the same look using it alone. Below: Orchid is a pale silver lavender metallic shade that covered nicely in 2 coats. This type of finish sometimes shows brush strokes, but I had a smooth application on it. 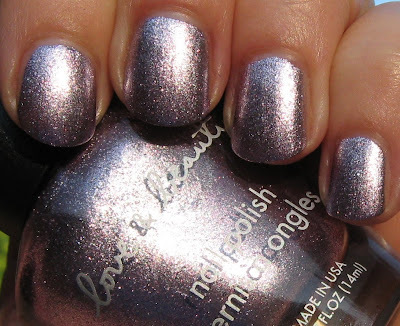 Below: Rose is a medium pink metallic shade that was less foil-like that Orchid. This seemed quite sheer, but I was satisfied with the look 2 coats provided. This one has tiny pink and gold glitter and while I'm not a huge fan of pinks, I think this is very pretty. I have one or two of these in a creme finish, so I'm anxious to try those out and see if the application and coverage is as nice as these were. All in all, these are nice polishes, especially for the price. I think I need to get my hands on these. Nice price too. 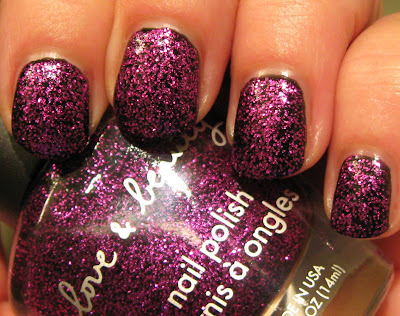 I have a fuchsia Love & Beauty polish and I love it, especially on my toes. It covers nicely in just one coat. These polishes seem like good quality for the price. The Black/Purple with it's brilliant is okay. The rest I do like. The Black/Purple seems to be the same as LA Girl Rockstar (from the Rockstar collection). I picked up a L&B early this past summer. It wasn't any of these but like a foily olive color. I was quite impressed with how this polish/product did such a good job.